I love to see old cars that seem to be actual drivers as opposed to show cars. 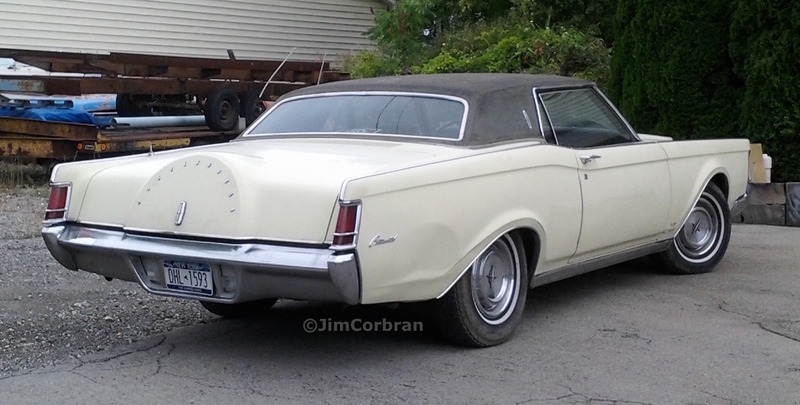 At least that’s what I figured this Lincoln Continental Mark III to be. This was the first generation of the Mark III personal luxury coupe (1969-71); there was a Continental Mark III sold for model year 1958, but in the later 1960s Lincoln seemed to want to forget about that one — those earlier cars weren’t even Lincolns, but were sold by the Continental Division. Things went south so fast that Ford dissolved the Continental Division after MY 1958 and merged it with Lincoln-Mercury (which also took in the ill-fated Edsel Division). Saw this one a while back in Niagara Falls.